That is why NETGEAR launched its new Multi-Gigabit Smart Managed Pro Switches with 10G Copper/Fiber Uplinks. Each port automatically detects which speed is needed by the connected device and provides the adequate speed. As opposed to regular 10-Gigabit switches that will only provide 1-Gigabit connectivity to any device that require less than 10-Gigabit, the MS510TX and MS510TXPP give the exact speed required, with no downgrade. Also, the new NETGEAR Multi-Gigabit switch ports can connect regular CAT5e Ethernet cables, without the need to upgrade to CAT6 wiring, therefore reducing wiring costs and hassle. 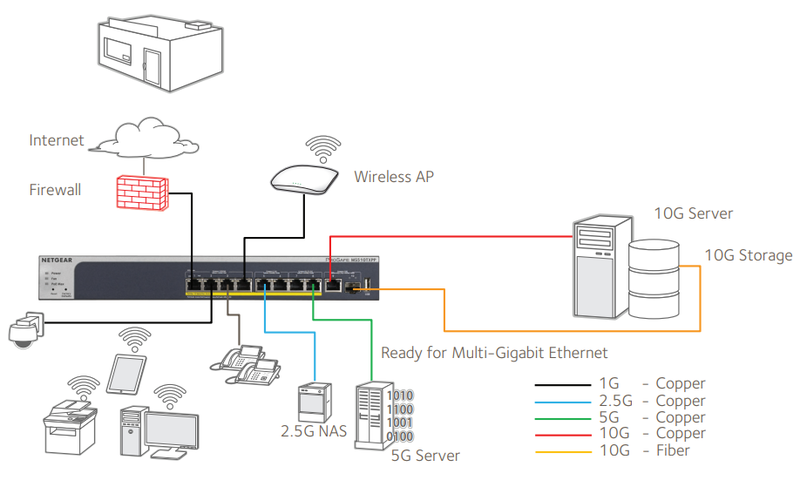 Access, Aggregation or Collapsed Core: You can now have your PCs, printers and routers/ firewalls connected at 1G and aggregate Multi-Gigabit Ethernet new devices on the same switch, all line-rate. 10G copper and fiber ports are ready for local servers and storage, or high-speed aggregation to your network core. Resource CD with installation guides, Smart Control Center utility software, MIB files, and links to additional online documentation including the Web browser-based management GUI User Manual and datasheet. Download the NETGEAR Multi-Gigabit Ethernet Smart Managed Pro Switches Datasheet (PDF).